Before I jump into the review proper I’m going to take some time to talk about some geeky film tech stuff. I know there’s some of you that aren’t going to care, and if that’s you feel free to skip ahead, I’ll have the actual film review part marked so you know where to find it. That being said, I feel it’s important to talk about the High Frame Rate presentation right up front because it will color some of my reactions to the film itself. For those of you who don’t know, Director Peter Jackson chose to shoot The Hobbit at 48 frames per second, twice the standard film speed of 24 fps. I saw the film in one of the theaters that is presenting it at the higher frame rate and it was an… interesting experience. This new technology has been very polarizing with critics, and I personally fall into the “no sir, I don’t like it” camp. Theoretically, doubling the frame rate would double the clarity and smoothness of the picture, but neither my eyes nor brain were ever able to accept it. What was supposed to feel more natural looking felt strange and unnatural. A lot of the film felt like it was slightly sped up, like it was playing in fast forward, and it coated the whole experience in a layer of cheapness. What is probably one of the more expensive films made this year felt like a made for TV production with this higher frame rate. Granted it wasn’t this way for the whole movie, there were moments when the effect did work on a certain level, but even when it did work it never wowed me. I never felt like the presentation made a compelling argument for itself as “the future of cinema.” At best it wasn’t any worse than standard frame rate, at worst it ruined the cinematic feeling of the movie and shattered my suspension of disbelief. If you’re a film geek it’s definitely worth checking out just to experience it because it’s certainly different than any movie you’ve ever seen before, for everyone else I recommend seeking out a non-HFR screening of the movie because I believe it will likely work better as a whole experience with the standard frame rate. So with all the tech-talk out of the way, how did I actually feel about the film? For me it was kind of a mixed bag. Allow me to say up front that this is not The Phantom Menace, it’s not even Revenge of the Sith; the film has its problems, but it isn’t fundamentally broken like the Star Wars prequels were. While George Lucas showed that he neither cared for nor understood the universe he created, Peter Jackson is obviously very much in love with Middle Earth and his love of the world shines through in the film. Unfortunately, I feel like his love of the material may have caused him to lose a bit of his focus as a story teller. The biggest problem with The Hobbit: An Unexpected Journey comes down to story focus, the film meanders a bit from one set piece to the next without any real sense of purpose. There are stories about the original cut of Star Wars, that it was long and poorly paced and didn’t connect well with people, and was eventually saved in the editing room where it was cut to be much more punchy and exciting. That is how An Unexpected Journey feels. Rather than pulling you through the experience and making you anticipate what’s coming next the film lays out all the pieces and then wanders through it without a lot of agency. There’s a few factors that I think contribute to this problem, the first of which is the most obvious: the movie is just too long for the material it’s trying to cover. Part of this comes back to the source material; while The Lord of the Rings trilogy is a grand, sweeping, and complex fantasy epic, The Hobbit is a story on a much smaller scale written for children. There simply isn’t the wealth of complexity to mine in The Hobbit, and even with the added beats that set the stage for the story of The Lord of the Rings it’s hard to argue that there’s enough material to justify three films. Two films, probably, but not three. This is where I feel like Jackson’s love of Middle Earth has caused him to lose focus as a filmmaker; it seems as if he’s more concerned with living in that world as long as possible than he is with telling the best story possible. Each of the previous Lord of the Rings films, while long movies in their own right, had excellent pacing and moved along with a real sense of purpose. Jackson streamlined the occasionally rambling stories of Tolkien into exciting and punchy fantasy adventures. Even the Special Extended Editions very rarely felt like they contained material that would have been better left on the cutting room floor. The Hobbit: An Unexpected Journey, on the other hand could easily lose at least a half hour and absolutely be a better movie for it. A lot of it feels like unnecessary exposition and padding for time and never moves with the purpose or excitement of the previous films. The other problem is that there are not many compelling characters for the audience to connect with. 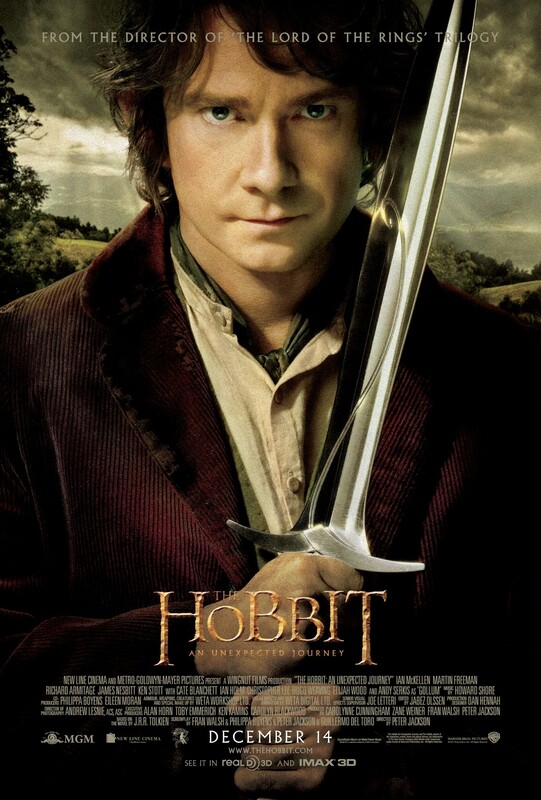 There are standouts, for instance Martin Freeman is excellent as Bilbo Baggins and brings both the flustered reluctance and legitimate heroism necessary for the role. In terms of acting chops Freeman blows away anything done by Elijah Wood in the previous trilogy of films. Ian McKellan is great as expected in the role of the more eccentric and humorous Gandalf the Grey (as opposed to the more serious Gandalf the White that was present in most of The Lord of the Rings), and the rest of the returning cast in their limited roles feel at home playing these characters. However, there are thirteen other characters that share the majority of the screen time with Bilbo, and these are the thirteen Dwarves: Bifur, Bofur, Bombur, Ori, Dori, Nori, Oin, Gloin, Fili, Kili, Dwalin, Balin, and Thorin Oakenshield. Of these 13 Dwarves only two have any depth of character, and those are Thorin and Balin; the rest are shadows, one-dimensional cardboard cutouts, there to fill the scene without having any real purpose. I can name all the Dwarves, but I’d be hard pressed to assign names to faces, even after spending three hours with these characters. Yes, these are a lot of characters, and it can be tricky to imbue a cast this large with the required depth, however, fifteen main characters isn’t significantly more than the nine members of the Fellowship in the original films, each of which were fully formed characters with distinct personalities and stories. And yes, I am aware that there was very little characterization of the Dwarves in Tolkien’s original novel and the focus was primarily on Bilbo who both narrated and carried the story. The difference here, though, is that the film keeps wandering away from its strongest character to focus on people who are not nearly as compelling. The worst of this happens when the film jumps for an extended period of time to the perspective of a character who sits on the fringe of the story and doesn’t tie directly in with our heroes. There’s a payoff for this later on, but it still is an example of the clunky inelegance that permeates a lot of the film. Another, more minor issue I had with the film was that it relied a bit too heavily on CG visual effects and lost some of the tactile quality that existed in The Lord of the Rings trilogy. Granted, some of this may be colored by the experience of seeing the film at the higher frame rate which made the whole experience feel a bit cheap looking, but there was a lot of it that felt like a video game cutscene. The previous films were certainly known for their groundbreaking computer effects work, but even in those films there was rarely a time when there wasn’t at least one practical element in the shot. An Unexpected Journey however, frequently features shots that are entirely composed in a computer. It never reaches the oversaturation of computer effects as seen in the Star Wars Prequels, but it’s a definitive step in the wrong direction. Orcs and Goblins that were created with fantastic makeup work in the previous films are now rendered entirely in CG, and they often feel a bit cartoonish rather than tangible and menacing as they have before. Perhaps this was a stylistic choice to be more in line with the tone of the book, but it didn’t work for me. That being said, the short time Gollum is on screen is absolutely incredible. Remember how it felt to see Gollum for the first time back in 2002? His appearance in An Unexpected Journey almost recaptures that feeling of technological wonder. It’s easily some of the best motion capture work ever done and tops even Weta’s own work on Avatar by miles. Speaking of which, the entire “Riddles in the Dark” segment of the film works like gangbusters. It’s by far the best part of the movie and arguably worth the price of admission by itself. This sequence recaptures the magic of the original trilogy of films and proves that Peter Jackson hasn’t lost his touch, just perhaps lost his focus. I know this review is primarily negative, and I don’t want to sound like I disliked the film, because there were a lot of little things I liked about the movie. Martin Freeman as Bilbo, Bilbo and Gandalf’s first scene together, the introduction of the Dwarves, the meeting of several prominent characters in Rivendell, the “Riddles in the Dark” segment, etc. However, even though the movie gets a lot of little things right I feel it misses the mark on several of the bigger issues like characterization and story focus. All in all, The Hobbit: An Unexpected Journey was a disappointing mixed bag for me. As I said, it is by no means a bad movie; it gets the tone of the story right by capturing the fun and charm of the original novel while also recognizing the darkness of The Lord of the Rings looming over the horizon, it also features several great performances and standout moments. It is just unfortunate that it is undermined by an overlong and unfocussed story. I very much hope that this is the longest of The Hobbit films and that The Desolation of Smaug and There and Back Again aim closer to the two hour mark than the three hour mark. The Hobbit needs to be fast paced, punchy, and fun, not long and meandering. I hope that Peter Jackson is able to look at the next couple films more from the standpoint of a story teller than from the standpoint of a fan who wants to see everything up on screen. As screenwriter Ted Elliot once said “The way to make a boring movie is to show everything.” Jackson needs to allow himself to make some of the difficult cuts required to make the films work the way they need to. There’s a great story to be told here, it just needs to be told with a greater sense of purpose and focus.